Download to get FREE access to all local listings from your smartphone or tablet. 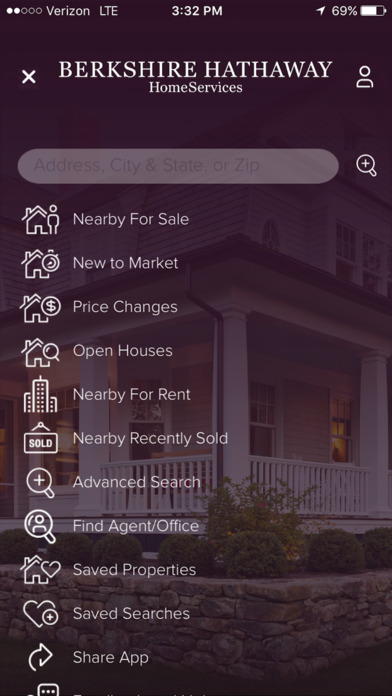 Search all listings in your neighborhood right from your mobile phone. Bookmark your favorite properties so you can keep track of your top choices. Save searches for properties that interest you. Search nearby homes for sale in your area! Search and stay updated with newly listed properties! Check out recently sold listings and market trends! Save searches & properties for properties that interest you. Easily find, and connect with a BHHS professional Agent! Receive the latest real estate trends, listings, price changes etc. Use Berkshire Hathaway HomeServices Home Search anytime to find available homes using GPS search, or find homes based on address, city or zip code. It displays the facts you want to know about a property, including price, square footage, estimated mortgage, taxes, features, descriptions, pictures, maps and more! Best of all, you can quickly and easily find homes that match your search criteria later when you save your favorite search parameters. You can also text and email homes to your family and friends.